My job as a Chiropractor is to find and correct a mechanical insult to the nervous system found in the spine when it misaligns called a Vertebral Subluxation. These Subluxations damage nerve actions and supply leading to all manner of health problems and disease processes which may be so subtle at the beginning you don’t even know, to a raging health problem after years of altered and depleted nerve supply. X-Ray is what most Chiropractic offices use to find Vertebral Subluxations; for the longest time I’ve looked for an alternative to X-Ray because I knew they weren’t good for the body, then in 2007 the World Health Organization and the Centers for Disease Control and Prevention came out and told us that X-Ray has been causatively linked to Leukemia, breast, lung and thyroid cancers!!! NO GOOD. I found something better called Thermography. In an article entitled “Chiropractic Thermography: Objectifying Subluxation” by Richard J. Story DC; Dynamic Chiropractic, January 14, 1994, it was stated: “The nerve pathways involved in the control of skin temperature have been well documented in the field of neuroanatomy (the study of nerves in the body). The biomechanical (how the body moves) alteration that occur in the presence of Vertebral Subluxation alters the function of these nerve pathways. It is because of the abnormal function of these nerve pathways that thermographic asymmetries verify the presence of Vertebral Subluxations. The Chiropractic adjustment corrects the Vertebral Subluxation and can be observed when the thermograms are returned to normal symmetry.” This means that Thermography shows the trouble areas in the spine and when they’ve been corrected. Along with tests of the reflexes, muscles, posture and mechanics of the spine we use Thermography to find and to monitor the adjustment so that we deliver to you the best care available in the industry. The world, “Chiropractic,” taken from the Greek, “cheir” (hand), plus “praktikos” (effective), means “effective hands.” The science of chiropractic is defined as being the science of adjusting by hand any or all luxations (dislocation) of the 300 articular joins of the human body, more especially, the 52 articulations of the spinal column, for the purpose of freeing any or all impinged nerves which cause deranged functions. Organs and tissues of the body depend upon normal nerve supply for normal function. Nerve Energy in the body is carried from the brain or central control through the spinal cord and its branches. The spinal cord is housed and protected by the column of bony segments (vertebrae) which compose the commonly known “back bone” of spinal column. Slight misplacements (subluxations) of these bony segments can provide for impingements upon the spinal nerves and even the spinal cord itself. This inhibits the normal flow of nerve energy over the nerve tracts. Thus abnormal positioning of the spinal segments will impair function through nerve interference. The resulting disease symptoms depend upon the area or level of the spine involved. The brain, housed by the skull, is the dynamic center of the human body and has a direct or indirect connection with all its tissue cells. From the brain, nerves pass down out of the skull through the spinal column in the spinal cord and the individual nerve branches from this great nerve trunk are given off at various levels, to pass out of the openings which are formed between the individual spinal segments or vertebrae as they sit one upon another. These openings are normal in size when the vertebrae are maintained in proper relationship. Abnormal positions of the vertebrae decrease the size of the openings and provide for impingement of the nerves and therefore for changes in the flow of nerve impulse from brain to tissue cell. Disturbed innervation means deranged action in the tissue cells. The theory underlying chiropractic procedure is that spinal subluxation creates impingement upon nerves, which affects the normal transmission of nerve energy to the various organs and tissues of the body. 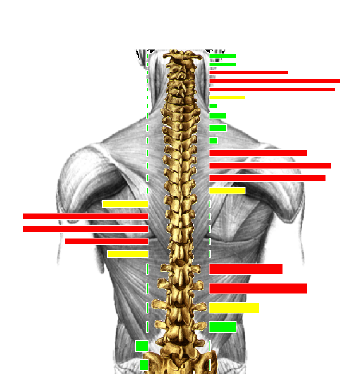 By adjusting the subluxated spinal segments, the flow of nerve energy is normalized and the CAUSE of the disease is removed. Nerve interference may cause paralysis of an arm, abnormalities of vision, inflammation of the kidney, inflammation of the knee joint, or inactivity of the bowel: the symptom depending upon the vertebrae and nerves involved. All of these ills and others too numerous to mention are the end results of deranged flow of nerve energy to the body structure. Such conditions respond favorably to chiropractic when the nerve impingement is corrected and the tissues are able to function normally once more. While backache or pain in the back is a common symptom, it is not always nor necessarily present with abnormal positioning of the vertebrae. A simple cold may also be an evidence of weakness, the causative factor being nerve pressure. Remember that from the skin into the innermost center of the body, all organs and tissues are supplied by the nerves; even the blood supply, the heart action, the digestion of food depend upon nerve energy for proper action. Chiropractic has advanced today to the point where adjustments are painless and the repositioning of spinal segments is a scientific procedure. Years ago, we rode by horse and buggy; today we travel by automobile and airplane. So, in chiropractic, we have found a way to restore the spinal column to normal by the use of force so slight that it causes no discomfort to the patient. Today we have instruments to help us locate the areas of abnormal nerve action that makes X-ray of seldom use. A very slight adjusting force is used, in accord with the structure and mechanisms of the body. I recently recieved an email from a fellow Chiropractor. The article was very informative and I wanted to share it with my friends! Thank you Dr. Jason Ulsrud from Rockstar Chiropractic! Take a look below at the first part of the article. “One of the most important things as a Chiropractor is to connect with the “Why” of what we do. Why Chiropractic? Why are you a Chiropractor? Why do you deliver the Chiropractic Adjustment? Why use Lasers? Why prescribe supplements? Why give massages? Why? Why? Why? As a Principled Chiropractor, the answers to these questions can all be easily answered by the 33 Principles set forth in Chiropractic. This is as much my connection with the Principle of Chiropractic as it’s a guide to help you connect with what Chiropractic really is. Chiropractic Philosophy cannot exist without the subluxation, otherwise it’s just anybody’s philosophy.